Philip II, King of France, in a non-contemporary portrait. Philip II Augustus (August 21, 1165 – July 14, 1223) was the King of France from 1180 until his death. A member of the House of Capet, Philip Augustus was born at Gonesse in the Val-d'Oise, the son of Louis VII and his third wife, Adela of Champagne. He was originally nicknamed Dieudonné—the God-given—as he was the first son of Louis VII late in his father's life. Philip was one of the most successful medieval French monarchs. He tripled the size of what later became France, greatly reduced England's French possessions and expanded the influence of the monarchy. He broke up the great Angevin Empire and defeated a coalition of his rivals (German, Flemish and English) at the Battle of Bouvines in 1214. He reorganized the government, bringing financial stability to the country and thus making possible a sharp increase in prosperity. In many respects, Philip II created the state of France. However, he saw the "estate" as his personal property. While his weaker rival, John of England was signing the document, the Magna Carta that secured rights and legal equality for all Englishmen and limited for all time kingly power in England, the stronger Philip was establishing absolute monarchy in France. It can be argued that the long term result of the tendency towards absolute Kingly power initiated by Philip was the French Revolution itself. His reign, though, was popular with ordinary people because he checked the power of the nobles and passed some of it on to the growing middle class by granting towns their charters of incorporation, which made them self-governing and self-taxing. What did not develop in France at this time was the concept of the nation as a common-wealth, in which everyone considers the welfare of the whole. Only such a foundation can eventually result in a world where all people live wholesome, dignified lives in freedom, with dignity, honor and the ability to achieve their highest potential. 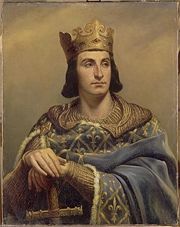 In declining health, Louis VII had him crowned and anointed at Rheims by the Archbishop] of Rheims William Whitehands on November 1, 1179. He was married on April 28, 1180, to Isabelle of Hainaut, who brought the County of Artois as her dowry. His father died on 20 September. While the royal estates had increased under Philip I and Louis VI, under Louis VII it had diminished slightly. In April 1182, Philip expelled all Jews from the land and confiscated their goods. Philip's eldest son, Louis, was born on September 5, 1187, and inherited Artois in 1190, when Isabelle, his mother, died. In 1181, Philip began a war with the Count of Flanders, Philip of Alsace. Philip managed to counter the ambitions of the count by breaking his alliances with Henry I, Duke of Brabant, and Philip of Heinsberg, Archbishop of Cologne. In July 1185, the Treaty of Boves confirmed to the king the possession of the Vermandois, Artois, and Amiénois. In 1184, Stephen I of Sancerre and his Brabançon mercenaries ravaged the Orléanais. Philip defeated him with the aid of the Confrères de la Paix. Philip also began to wage war with Henry II of England, who was also Count of Anjou and Duke of Aquitaine in France. Two years of combat (1186–1188) followed, but the situation remained unchanged. Philip initially allied with Henry's young sons, Richard and John, who were in rebellion against their father. However, news of the fall of Jerusalem in 1187 to Saladin, followed quickly by the death of Henry, diverted attention from the Franco-English war. Philip was close friends with all of Henry's sons and he used them to stir up rebellion against their father, but turned against both Richard and John after their respective accessions to the throne. With Henry the Young King and Geoffrey of Brittany he maintained friendship until their deaths. Indeed, at the funeral of Geoffrey, he was so overcome with grief that he had to be forcibly restrained from casting himself into the grave. In May 1200, Philip signed the Treaty of Le Goulet with Richard's successor king John of England, as youngest son of Henry called the Lackland, now also duke of Normandy. The treaty was meant to bring peace to Normandy by settling the issue of the boundaries of the much reduced duchy and the terms of John's vassalage for it and Anjou, Maine, and Touraine. John agreed to heavy terms, but Philip in turn recognized John as king, formally abandoning Arthur I of Brittany, whom he had previously supported, and recognized John's suzerainty over the Duchy of Brittany. To seal the treaty, a marriage between Blanche of Castile, John's niece, and Louis the Lion, Philip's son, was contracted. This did not stop the war, however. In 1202, disaffected patrons petitioned the French king to summon John to answer their charges and, when the English king refused, Philip dispossessed him of his French lands. Within two years, most of Normandy and the Angevin lands, including much of Aquitaine, had been conquered. The war, called the "War of Bouvines," continued for the next decade until Philip won a decisive victory at Bouvines (1214) over a coalition of forces that included the Emperor Otto IV and Ferdinand, Count of Flanders. The battle was crucial in ordering Western European politics in both England and France. In the former, so weakened was the defeated King John of England that he soon needed to submit to his barons' demands and sign the Great Charter which gave rights to men and established common law. 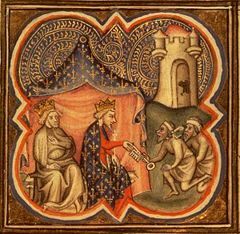 Philip (right) and Richard accepting the keys to Acre; from the Grandes Chroniques de France. Philip went on the Third Crusade (1189–1192) with Richard I of England (1189–99) and the Holy Roman Emperor, Frederick I Barbarossa (1155–90). His army left Vézelay on July 1, 1190. At first, the French and English crusaders traveled together, but the armies split at Lyons, as Richard decided to go by sea, and Philip took the overland route through the Alps to Genoa. The French and English armies were reunited in Messina, where they wintered together. On March 30, 1191, the French set sail for the Holy Land and Philip arrived on May 20. He then marched up to Acre which was already besieged by a lesser contingent of crusaders and started to construct large siege equipments before Richard arrived in June 8. By the time Acre surrendered on 12 July, Philip was severely ill with dysentery which reduced his crusading zeal. Ties with Richard were further strained after the latter acted in a haughty manner after Acre had fallen. More importantly, the siege resulted in the death of Philip of Alsace, who held the county of Vermandois proper; an event that threatened to derail the Treaty of Gisors which Philip had orchestrated to isolate the powerful Blois-Champagne faction. Philip decided to return to France to settle the issue of succession in Flanders, a decision that displeased Richard, who said, "It is a shame and a disgrace on my lord if he goes away without having finished the business that brought him hither. But still, if he finds himself in bad health, or is afraid lest he should die here, his will be done." On July 31, 1191, the French army of 10,000 men (along with 5,000 silver marks to pay the soldiers) remained in Outremer ("Overseas," was the name used for the Holy land during the crusades and for the crusader states established there) under the command of Hugh III, duke of Burgundy. Philip and his cousin Peter of Courtenay, count of Nevers, made their way to Genoa and from there returned to France. This decision to return was also fueled by the realization that with Richard campaigning in the Holy Land, English possessions in northern France (Normandy) would be open for attack. After Richard's delayed return home after the Third Crusade, war between England and France would ensue over possession of English-controlled territories in modern-day France. After Isabelle's early death in childbirth, in 1190, Philip decided to marry again. On August 15, 1193, he married Ingeborg (1175–1236), daughter of King Valdemar I of Denmark (1157–82). She was renamed Isambour. For some unknown reason, Philip was repelled by her, and he refused to allow her to be crowned Queen. Ingeborg protested at this treatment; his response was to confine her to a convent. He then asked Pope Celestine III for an annulment on the grounds of non-consummation. Philip had not reckoned with Ingeborg, however; she insisted that the marriage had been consummated, and that she was his wife and the rightful Queen of France. The Franco-Danish churchman William of Paris intervened on the side of Ingeborg, drawing up a genealogy of the Danish kings to disprove the alleged impediment of consanguinity. Pope Innocent III (1198–1216) declared Philip Augustus's marriage to Agnes of Merania null and void, as he was still married to Ingeborg. He ordered the King to part from Agnès; when he did not, the Pope placed France under an interdict in 1199. This continued until September 7, 1200. Due to pressure from the Pope and from Ingeborg's brother, King Valdemar II of Denmark (1202–41), Philip finally took Ingeborg back as his Queen in 1213. Understandably, he turned a deaf ear when the Pope asked him to do something about the heretics in the Languedoc. When Innocent III called for a crusade against the Albigensians or Cathars, in 1208, Philip did nothing to support it, but neither did he hinder it. The war against the Cathars did not end until 1244, when finally their last strongholds were captured. The fruits of it, namely the submission of the south of France to the crown, were to be reaped by Philip's son, Louis VIII, and grandson, Louis IX. From 1216 to 1222 Philip also arbitrated in the War of Succession in Champagne and finally helped the military efforts of Eudes III, Duke of Burgundy and Frederick II, Holy Roman Emperor to bring it to an end. Philip II Augustus would play a significant role in one of the greatest centuries of innovation in construction and in education. With Paris as his capital, he had the main thoroughfares paved, built a central market, Les Halles, continued the construction begun in 1163 of the Gothic Notre-Dame de Paris Cathedral, constructed the Louvre as a fortress and gave a charter to the University of Paris in 1200. Under his guidance, Paris became the first city of teachers the medieval world had known. It has been described as the new Athens as France became "the latest heir of the great world civilizations." In 1224, the French poet Henry d'Andeli wrote of the great wine tasting competition that Philip II Augustus commissioned in The Battle of the Wines. Philip II Augustus died July 14, 1223, at Mantes and was interred in Saint Denis Basilica. Philip's son by Isabelle de Hainaut, Louis VIII, was his successor. Philip also centralized the administration. In particular, he by-passed local lords as agents of the crown by appointing his own officials, who visited the regions to collect taxes and to administer justice. These men were mainly chosen from the middle classes. Initially, they were assigned to a district "for a limited period." If they "proved honest" they "could be appointed repeatedly but not to the same district." Since their "advancement depended on their loyalty to the king," they gave good service. While the English barons at this period are said to have had a concern for the welfare of the whole realm, the French looked after the interests of their particular counties. For this reason, Philip by-passed the nobility whenever he could. His "deputies" reported to him. He did not start a process by which the nobles, followed by the commoners, began to share in power, a process that was already underway in England. Philip made Paris his "chief residence," which became the capital of France. He fortified Paris and patronized the University, which soon developed into a leading center of scholarship at this time. By taking possession of the English lands North of the Loire, he added considerably to both the territorial size and to the population of France. This included access to the sea. Philip II is thus credited with taking the "first great step in uniting France," which may be the origin of his title "Augustus" in imitation of the first Roman Emperor. He may also have become known as "Augustus" because of his territorial conquest. By supporting the University, too, he added to his "imperial aura and bolstered" his status "relative to the other kings of Europe." He has been described as a "political genius." At the beginning of his reign, although he held the title "king" he was only one among the great feudal princes; "there was … no France as yet." By the end of his reign, he had tripled the size of the territory over which he exercised direct control. At the end of his life, only the Duke of Aquitane—who was also King of England—could claim to be his equal. Philip's "personal wealth," though "was greater than" the English king's. Philip also did much to centralize the administration and to lay the foundation for absolute monarchy. Later, Philip IV The Fair would claim the "divine right of kings." Philip favored municipalities as a unit of organization. Municipalities, that is, chartered or incorporated cities were free from the control of the feudal lords and governed themselves. Wealthy families appointed the burghers and elected the mayor. Burgers were almost always middle class, not members of the nobility. By increasing the number of municipalities, Philip gained the loyalty of the middle classes at the expense of the feudal lords, whom he accused of over taxing their tenants. However, as Philip II in France increased the power of the King, in rival England, the king's power was beginning to be subjected to the will, if not of the "people," then at least of the nobles, as the Magna Carta of 1215 placed limitations on the King's power. By 1265, the English Parliament was an elected Assembly with all classes represented. By the reign of Edward II even the king had to promise to keep the law of the "community' and without the consent of Parliament no new law could take effect. No parallel development of the French Estates-General (first convened by Philip IV) took place, so even on the eve of the French Revolution the non-elite saw themselves as oppressed and exploited, with little or no say in governance. While the weaker John was helping, even if reluctantly, to lay the one of the foundation stones of human rights and civil liberty, the stronger Philip was preparing the way for the eventual overthrow of the French monarchy. Philip is a character in James Goldman's historical play, The Lion in Winter. The play maintains the historical theory that he and Richard the Lionhearted had previously had a homosexual relationship. In the 1968 film of The Lion in Winter, which downplayed the homosexual aspect present in the stage play, Philip was played by Timothy Dalton. Jonathan Rhys Meyers played Philip in a 2003 television version which somewhat resurrected the matter. ↑ Xenophongroup, The 'War' of Bouvines (1202-1214), Military History Database. Retrieved October 22, 2008. ↑ Henri d'Andeli, La bataille des vins (Marburg, DE: 1886). ↑ Peter O'Toole, Katharine Hepburn, Anthony Hopkins, Jane Merrow, John Castle, Timothy Dalton, Nigel Stock, Nigel Terry, Anthony Harvey, and James Goldman, The Lion in Winter (Santa Monica, CA: MGM Home Entertainment, 2001, ISBN 9780792849209). ↑ Mikhalkov-Konchalovskiĭ, Andreĭ Sergeevich, Dyson Lovell, Patrick Stewart, Glenn Close, Andrew Howard, John Light, Rafe Spall, et al., The Lion in Winter (Santa Monica, CA: Lion Gate Home Entertainment, 2003). Adams, George Burton. 1970. The Growth of the French Nation. New York, NY: Macmillan. Baldwin, John W. 1986. The Government of Philip Augustus: Foundations of French Royal Power in the Middle Ages. Berkeley, CA: University of California Press. ISBN 9780520052727. Claster, Jill N. 1982. The Medieval Experience, 300-1400. New York, NY: New York University Press. ISBN 9780814713815. Ferruolo, Stephen C. 1985. The Origins of the University: The Schools of Paris and their Critics, 1100-1215. Stanford, CA: Stanford University Press. ISBN 9780804712668. Goldman, James. 1983. The Lion in Winter. Harmondsworth, UK: Penguin Books. ISBN 9780140481747. Goyau, G. 1911. Philip II (Augustus). Catholic Encyclopedia. New York, NY: Robert Appleton Company. Retrieved October 22, 2008. Duby, Georges. 1990. The Legend of Bouvines: War, Religion, and Culture in the Middle Ages. Berkeley, CA: University of California Press. ISBN 9780520062382. Meade, Marion. 1977. Eleanor of Aquitaine: A Biography. New York, NY: Hawthorn Books. ISBN 9780801522314. Payne, Robert. 1998. The Crusades: A History. Wordsworth military library. Ware, Hertfordshire, UK: Wordsworth Editions. ISBN 9781853266898. History of "Philip II of France"
This page was last modified on 31 October 2008, at 14:59.